I like the look of everything so far, what happens next? You come to Thomas Towers for a chat and some cake and we get acquainted. I find out all about your wedding and what you like to eat. Together we figure out what you are going to eat; you go away happy and hungry and I go away to design and create your bespoke menu and quote. How does your pricing work, is it per head? Yes, our price is always per person, this includes everything no hidden extras. And by everything you mean? Your price will include a Senior Chef, Front of House Manager, all serving staff, all crockery, cutlery, any additional specialist kitchen equipment you may need for your yummy menu. Full project planning, menu design and final run through meeting are all part of the service. So what do we need to supply for you onsite? A catering tent 36 metres squared, kitchen or covered area attached to (or very close to) the main marquee/tipi. There will need to be even flooring with no dangerous obstructions (no grass, sand or mud please). We do not supply catering tents. Food is our game not tents but we do love to work in them! Good lighting (it might look pretty for the guests but we can’t work by fairy light)! OK, sounds good – so do you supply linen? Do you set our tables? Do you supply the glasses? Will your staff serve our drinks? Yes we will serve your welcome drinks (usually served with canapés) and all wine and water to the table plus Champagne for the toast. Is there a corkage fee for this? There is a small service fee for serving welcome drinks but no corkage for wine service to tables. Do you provide bar staff? We can do this if you are supplying your own alcohol and would like some staff to man a free bar. I’m afraid we can’t change barrels or pumps. We also offer a simple cash bar which works on a minimum tab. If you’re looking for a mixologist creating lots of crazy cocktails, then you would need a professional bar company. Our bar staff operate a challenge 25 scheme. If you are lucky enough to look under 25 you will be asked to prove that you are aged 18 or over when you request an alcoholic drink. Do you include tea and coffee? Yes, if you want tea and coffee we serve this from a station all day until one hour after your meal so anyone who wants a cuppa can help themselves. Can we really have anything to eat? Yes, it is your wedding so you should eat whatever you like best. The only things we can not do are Hog Roasts (with the pig on a spit, although we do an amazing 8 hour slow roast pork shoulder) and Pizza’s (we don’t have the ovens) again we can point you in the right direction of specialist suppliers. Can we offer guests a choice of menus? You can but we don’t recommend it, if you want more variety I’d say to go with sharing platters or bowls so there is loads of choice. Children’s meals are available to anyone under 10 years of age. Price can vary depending on menu choices but we can create a special menu for the children which is priced separately. We will cater for any special diets, just let us know who they are where they will be sitting (ideally on a copy of your table plan) and we’ll ensure they can have an amazing meal that fits their needs. The same applies to allergies – let us know of any and we will ensure no traces are includes in the meals. We never take any changes with allergies. How do you make sure everything runs smoothly? When we first meet I get as much information as possible about your wedding day, we then have a final run through meeting about 6 weeks before the big day where we cover everything from the timings for set –up and the day, final numbers, table plans, special diets, number of staff meals, key contacts and any special instructions (i.e. Mother of the bride likes extra gravy or no Champagne to be served until after dessert). All this information is fed into our working document which is the onsite bible for your event. Our Operations Manager uses this to brief the onsite team and ensure nothing is missed. You can of course get in touch at any point if you have any questions, changes or need any advice or support. Tastings at Thomas The Caterer happen strictly in the months of November, December, January, February and March only. If we cannot make your tasting happen we are sorry about this however we simply cannot do tastings during our busiest seasons spring, summer and early autumn. The silver lining to not having a tasting is we simple won’t charge you for it! We hope you understand during the wedding season we must ensure that quality remains at the forefront of our priorities. Each of our menus is bespoke and takes a considerable amount of time out of our working week, and preparing a tasting is no small quick job, this is why we have set this time apart from the busy wedding season. 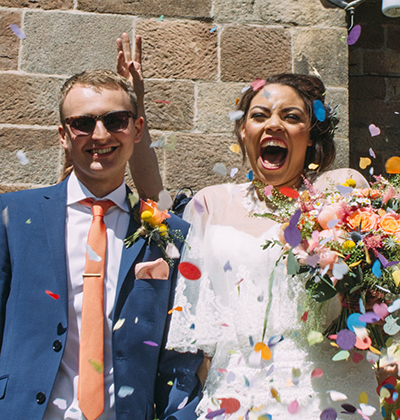 Your Wedding Day – the best bit! Staffing, who will be there on the day? We plan our staffing at 1 per 20 guests plus one extra member of staff! There is always a Senior Chef and Front of House Manager at every wedding. Your Chef is either me or my Senior Chef, the Thomas The Caterer team have worked with me for a long time and are all trained to the Thomas standard, I don’t work with agency staff – it is always my dream team. We generally arrive the day before your wedding set up and deliver all crockery etc and set tables. We then return the next day (the wedding day) normally two or three hours before the wedding party arrive back at the venue. How will my food be prepared? All food is prepared to the furthest point at Thomas Towers, it is then safely transported to your venue where it will be finished off, for example chicken breasts are seasoned and sealed at Thomas Towers, chilled and transported ready for the oven where they are cooked onsite. What do we do if we have any problems on the big day? So how do we book? Simple, just drop us an email to say you want to go ahead and we’ll raise a deposit invoice. This confirms your date as unfortunately we can’t hold dates until a deposit is paid. You can pay via BACS or cheque. We regret that we cannot accept credit card payment. Do you have minimum numbers? We work a minimum number of 60 guests per event. We have to do this to ensure staffing and overhead costs are covered. Final numbers are due six weeks prior to your wedding date. At this point we will issue your final invoice. You will only be charged for the exact number of guests, minimum numbers of 60 apply (see below). After this point, any cancelled guests are non-refundable, and additional guests are chargeable. All invoices must be paid before your event date. Phew, that was a lottttt of information but at Thomas Towers clarity is king.